Not only has the radio station’s format been changed, but the dean has begun the reorganization of the radio and television stations. One of his announcements at the faculty meeting was today was the day that 14 employees of the stations would be laid off. 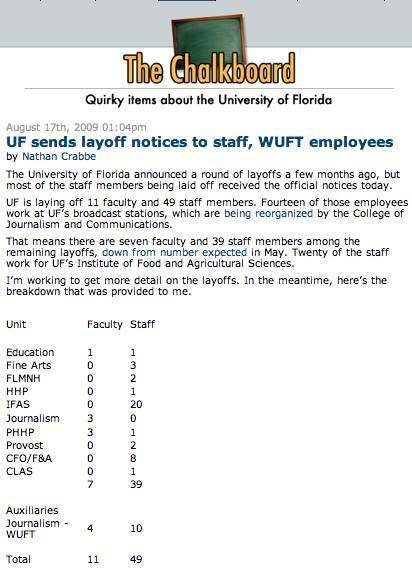 The Gainesville Sun posted the layoff list, which included faculty layoffs announced earlier this summer. Out of 18 colleges, our college laid off 7 of the 11 faculty campuswide and 10 of the 47 staff.